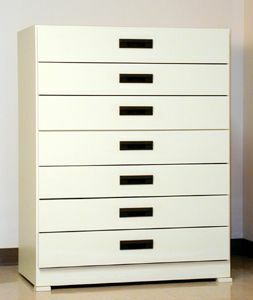 Accuride all steel glides for full extension drawers. Designed for front to back filing of 4 x 6, 5 x 8, 6 x 9, 9 x 12 and 9 x 15 files. Available in 5 standard colors with 13 different edge banding colors. Drawer Pull Options: SRP Black, SRP Brown, SRP Gray, Symatic Chrome, Old Ancom Brass. Combination cabinets and other standard cabinets are available. Locks on cabinets are optional. Call Ancom at 800-845-9010 or send an e-mail to request@ancom-filing.com for more information on these and other options.